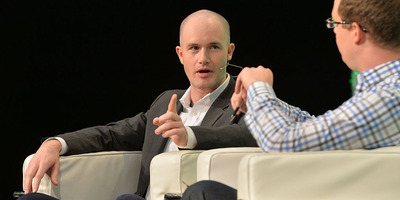 Anthony Harvey / StringerCoinbase CEO Brian Armstrong. Coinbase is now officially valued at $US8 billion. The bitcoin exchange announced a $US300 million series E round on Tuesday, with a mega valuation to match. The popular cryptocurrency exchange Coinbase is now valued at $US8 billion after a mega funding round, the company announced Tuesday. That round, led by Tiger Global Management, infuses the crypto startup with $US300 million to “accelerate the adoption of cryptocurrencies and digital assets,” according to the company. Its new $US8 billion valuation means Coinbase is now publicly valued higher than the $US7.1 billion Slack and the $US7.6 billion Instacart. Rumours of the valuation were first reported by Recode in early October. The company was valued at just $US1.6 billion in August 2017 thanks to funding from big names like IVP, Spark Capital, Greylock Partners, and Battery Ventures. In February, Coinbase vice president Dan Romero told Business Insider that the company’s goal was to become the Google of crypto. Read more about Coinbase’s strategy to become the Google of cryptocurrencies.